Nigerians in Space: My sci-fi novel turned out to be closer to the truth than I expected. 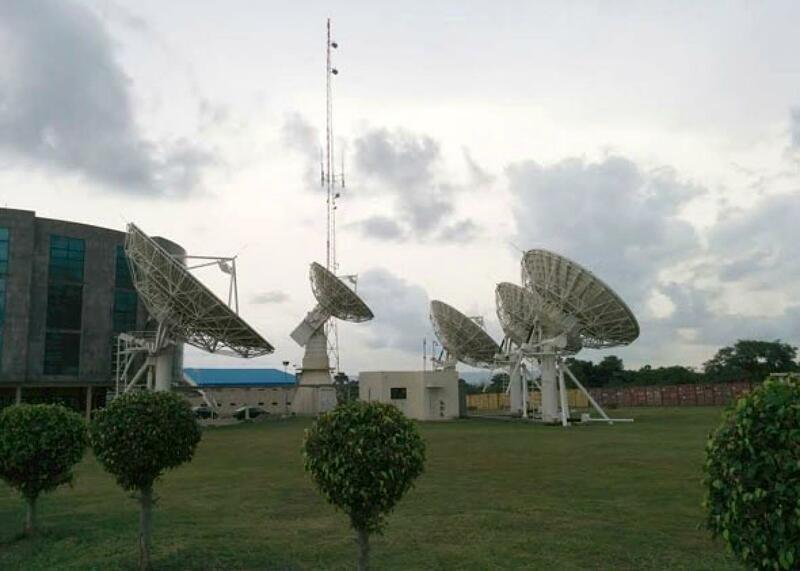 The satellite wing of the Nigerian space agency. This piece is part of Future Tense, a partnership of Slate, New America, and Arizona State University. On Thursday, Oct. 2, Future Tense will host an event in Washington, D.C., on science fiction and public policy, inspired by the new anthology Hieroglyph: Stories & Visions for a Better Future. For more information on the event, visit the New America website; for more on Hieroglyph, visit the website of ASU’s Project Hieroglyph. What if an African country could surpass America’s most ambitious achievement? Ever since high school, when I learned about the space race, I have been fascinated by the United States’ struggle to beat the Soviet Union to land a manned mission on the moon’s surface. The original “moonshot” grew out of a geopolitical rivalry that cost an estimated $107 billion in today’s dollars. The money probably could have been spent on education, roads, or health care, but most Americans took pride in Neil Armstrong’s first steps on the moon. I am half-Nigerian, so like many second-generation Americans, my gaze was also turned to the other source of my heritage. Why couldn’t Nigeria have a space program? In 2006, I had traveled to the capital of Abuja with my father, who was helping to found a technology village that had been envisioned by the minister of the federal territory, Nasir El-Rufai. El-Rufai was a visionary who wanted to tap into the skill sets of Nigerian scientists in the diaspora and create a hub with a university and tech firms like the Research Triangle Park in North Carolina. After my visit, I was so affected by El-Rufai’s ambition that I wrote Nigerians in Space, a thriller about a Nigerian scientist who emigrated to the United States to work for NASA and pursue his dream of going into space. Without spoiling the plot (this happens in the first chapter), the scientist is tempted back to Nigeria by a smooth-talking government minister to develop his space program with a guarantee of a high salary and unlimited resources to accomplish the project. In the end the character decides to take the minister’s offer, and then all hell breaks loose. There’s also an abalone smuggler from South Africa, and a Zimbabwean freedom fighter, and some sci-fi hocus pocus, but the crux of the plot centers on this concept—Nigerians going into space. Imagine my shock when I discovered that the program was indeed real—and it has been around for more than a decade. A few weeks ago, I returned to Abuja for work, and a lot had changed since I visited in 2006. The kernel of an idea for the technology village had blossomed into the African University of Science and Technology, which is now recruiting talented graduate students from around the continent to pursue Ph.D.s in engineering on its growing 200-acre campus. Smartphones were as prevalent as they are on the streets of New York. Indeed, I was in the country to help design legislation to promote Internet freedom on behalf of PEN American Center, something unimaginable in 2006. On my last day, I met with Dr. Olufemi Agboola, the director of engineering and space systems at the National Space Research and Development Agency. Now I should back up. In my novel, my main character was a Nigerian émigré who had received his Ph.D. in lunar geology and then worked for NASA. In reality, Agboola received his Ph.D. in engineering from an American university and then worked for NASA. He was then invited to lead engineering for the nascent space agency in Nigeria—and what he discovered when he arrived was not how the program had been pitched to him. There was something absolutely terrifying about meeting in real life a person whom I thought I made up. Some of the characters in the novel were based on real people—for example, on an abalone farmer and a prosecutor I had met in South Africa while researching the story. But this was the opposite: A fictional character become real. Before me sat an individual with agency and flaws and nuance. I was nearly silenced by the absurdity of our encounter. Since the program was founded in 2003, Agboola’s agency has launched five satellites into space. Admittedly, one satellite built by China failed after launch, but China had trained Nigerian scientists in the process, providing skills transfer, and an insurance policy supposedly covered the cost. There are two reasons why I didn’t know about the space program when I started writing my novel eight years ago. The first is that it seemed too ridiculous to even be worth researching—I had made the idea up! The second is that at the time, I was living in Cape Town, which had the Internet connectivity of a rural town in the U.S. circa 1998, and which was suffering from rolling electricity blackouts. So most of my research was done with good old-fashioned books. Only when I returned to the U.S. and I started working on a new draft did I conduct a proper Internet search. I suspected there would be plenty of excellent engineers working on the program, but I had no idea that there would be someone with such a similar background to my main character. 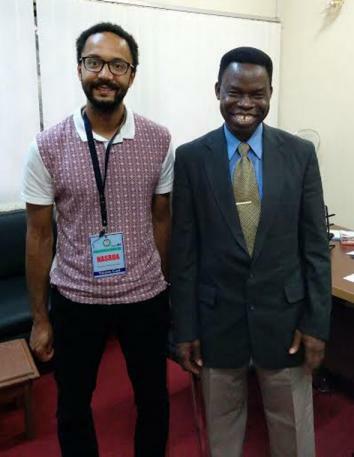 Deji Olukotun and Dr. Olufemi Agboola. Anyway, Agboola was forthright and honest about his struggles of trying to operate a viable scientific agency in a country known for its corruption. As we talked, I recognized that he was a clearly brilliant man who was being stifled, at least in some aspects, by a Nigeria not quite ready to embrace its own talent and ambition. The physical building itself attested to that fact. The foyer was decorated with a model Soyuz rocket and satellites, but the vinyl paneling flaked off the walls, and his enormous office seemed bare of furniture. The program also was not sailing along as effortlessly as Agboola had hoped, and he desperately needed funds, manpower, and the political will to further his research. Nasir El-Rufai, mentioned earlier, was a likely ally who could have enabled the program to prosper, but he had been forced into exile in a reshuffling of the presidential Cabinet under allegations of corruption. Our conversation was mostly personal, and that’s why I’m paraphrasing it here, but when I gave Agboola a signed copy of my novel, I did not feel like celebrating. I felt honored to have met the man, but I had also learned the perverse burden of responsibility placed on an author who writes speculative fiction. One of the noble ambitions of Neal Stephenson’s Hieroglyph project is to move away from the dystopian mode of storytelling. While books such as George Orwell’s 1984 have tremendous appeal, they are projections of our foremost fears, essentially imagining things in the status quo changing for the worse. But science-fiction writers have a responsibility, in the view of the Hieroglyph project, to excite the public imagination with possibility. What I learned from my meeting with Agboola is that it does not feel good to predict human failings and for them to turn out to be true, especially when there are people striving so hard to overcome these failings and to create a better world for their fellow citizens. Here was a man daring to dream, and in my fiction I had snuffed out that dream. This in a country currently wracked by the militant Islamic group Boko Haram and the dreaded Ebola virus. There is little courage in presaging that things will turn out for the worse. But it is not so easy to write positive stories, either, because fiction thrives on conflict. If every character gets along fine, the tension will dissipate and the reader will stop turning the page. It would have been far more challenging for me to envision a better Nigeria in fiction, or at least a different one. As I left the space center, Agboola asked me to tell the world about his program. Tell me, would you have read that story? Will you read it if I write it?